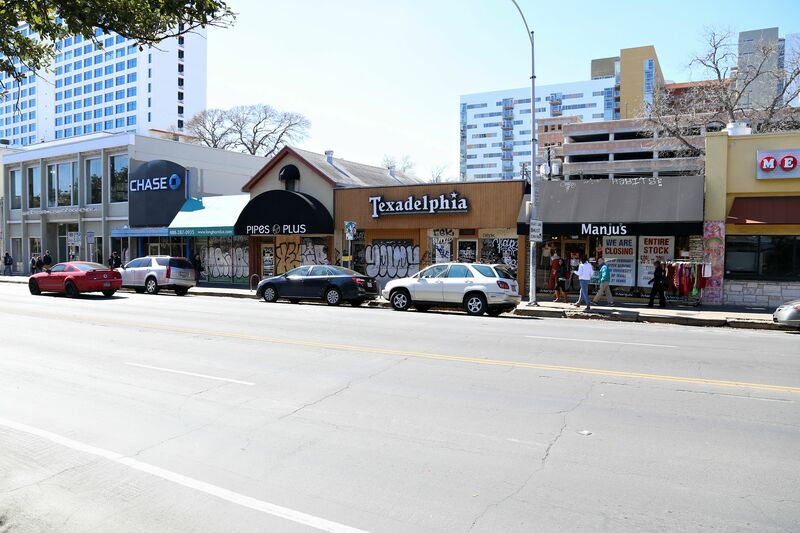 Urban Outfitters, Inc. bought out the expired leases of five stores lining Guadalupe Street. Mellow Mushroom, Texadelphia, and Manju's are amongst the popular stores that will be leaving. Mellow Mushroom and Manju’s are leaving Guadalupe Street because of Urban Outfitters’ upcoming expansion across five neighboring stores. Urban Outfitters bought out the leases of five stores on Guadalupe Street, including Manju’s and Mellow Mushroom. Austin-based BHF Guadalupe LLC, a business service company, owns all of these stores except for Mellow Mushroom, which the Washoe Company of Luling, Texas, owns. Chase Bank’s lease did not expire in January, so Urban Outfitters’ expansion will not affect it. Urban Outfitters has bought the lease for its back parking lot, though. Urban Outfitters is currently applying for a wine and beer retailer’s permit with the Texas Alcoholic Beverage Commission, according to a sign posted on the abandoned Texadelphia building. The permit would allow the store to sell alcohol on its premises and require it to provide seating for customers. The company plans to expand its retail space and add areas for food and drink. There are no definite design plans as of yet for the expansion, Schmidt said. Mellow Mushroom manager David Torres said the only thing he is sure of is that the restaurant’s lease will expire in June. Urban Outfitters’ expansion into alcohol and food parallels an Urban Outfitters in Brooklyn, New York, called Space Ninety 8. Described as “a unique retail concept” by its website, Space Nintey 8 offers a bar, restaurant and gallery in the same area as its retail store. Urban Outfitters currently has more than 400 stores worldwide and has a market capitalization of $5.07 billion. Manju’s owner, Kavita Sajnani, said she will not be able to renew her lease because of Urban Outfitters’ purchase. Sajnani opened the clothing store 37 years ago with her husband after moving to Austin from India. BHF Guadalupe LLC originally told Sajnani to close at the end of February, but the company gave her a three-week extension to close out. Aerospace engineering senior Francisca Jaramillo has been working at Manju’s since last May. She applied for a job at Tyler’s when she heard Manju’s was closing, but said she would miss Sajnani as a boss. Mellow Mushroom may relocate to Round Rock, Torres said, but that move is not definite. Manju’s will not relocate unless a location near campus opens up, according to Sajnani.